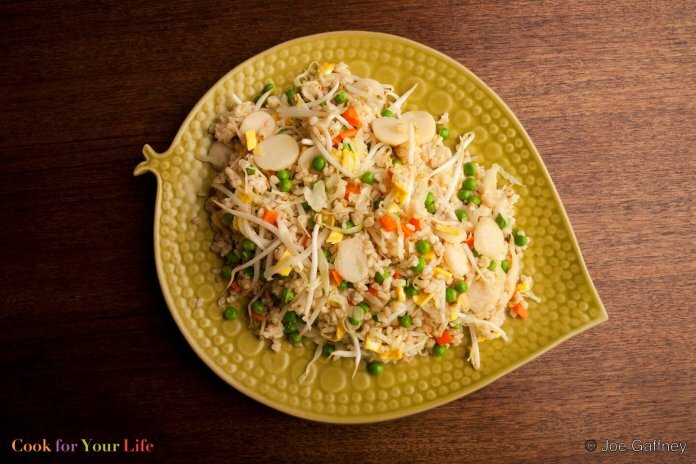 This veggie fried rice is a great stand-by if you have left over brown rice in the fridge or freezer. It’s easy to make, a crowd-pleaser, and oh so much better for you than takeout. 1. Whisk the eggs, water, and salt together in a small bowl. Heat 2 teaspoons of oil in a skillet over a medium-high heat. Pour the eggs into the pan. Tip the pan from side-to-side to quickly spread the eggs into a thin omelet. When the eggs are just set, slide onto a plate, roll and cut into ¼-inch strips and then across into a dice. Set aside. 2. In a small bowl, mix the sugar and soy sauce and stir until the sugar has dissolved. Set aside. 3. Heat the remaining 3 tablespoons of oil over a medium-high flame in a wok or wide skillet. Add the diced ginger. Let it sizzle for a few minutes then add the onion, carrots, and water chestnuts and stir-fry until they start to soften. 4. While the onions and vegetables are cooking, heat 1 teaspoon oil in a small saucepan. Add half of the scallions, let them sizzle for a second, then add the frozen peas plus 2 teaspoons of water. Cover and cook until the peas are tender. Set aside. 5. Add the diced eggs, and the soy sauce and sugar mixture to the vegetables. Cook stirring until they are well coated. Add the cooked rice and stir to mix. Add the peas and any liquid in their pot. Stir to mix. Cook until the rice has heated through. 6. Add the remaining scallions, the shredded cabbage, bean sprouts, and cilantro. Toss together until well mixed. Once the cabbage has wilted, check for seasoning and serve immediately. Dishes like these are fantastic ways to empty your fridge of leftovers. You can put in anything you like. If you are vegan, instead of eggs use firm tofu cut into a small dice, if you are a carnivore add shredded chicken in step 3 with the onion and carrots. Add diced bell pepper at this time too if you have some to spare.